Manufacturers in the U.S. reported March activity had slowed for the fifth straight month according to an Institute of Supply Management survey released on Wednesday. 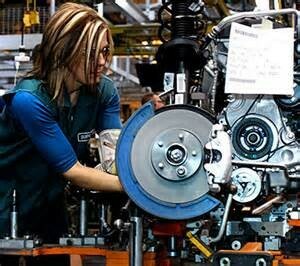 The manufacturing purchasing manager’s index from ISM dropped in March to 51.5 from February’s 52.9. The index slowed every month since October, when it was sitting at 57.9. Economists surveyed expected the most recent PMI to drop to 52.5. Any reading that is over 50 indicates there is growth. The ISM pinpointed a number of factors that included weather, higher costs of healthcare and a stronger U.S. dollar as causes for the drop in manufacturing. In the survey from March, of all 18 industries, 10 reported there was growth. The largest disappointment was a drop in the index for employment that fell from 51.4 during February to 50.0 for March. Earlier on Wednesday, the payroll processor ADP reported that its total numbers for new job for the private sector showed a drop of over 1,000 in manufacturing. Overall, the jobs report showed that only 189,000 new jobs had been added by the private sector during March, which was 38,000 less than anticipated and the first time since January of 2014 that the total was under 200,000. Last year for the year, the average increase was 260,000. Manufacturers in the U.S. are not letting inventories grow at a quick pace. The inventory index for the ISM was down from February’s reading of 52.5 to March’s 51.5.